TourBar is planning to add several key updates and enhancements to the site, that will make your experience even better and easier. We're already the leading destination for finding great travel buddies from across the entire world, but we know you'll love the new upgrades, too. At TourBar, we certainly understand that browsing photos from other users is one of the most important aspects of the connection process. That's why we encourage all users to upload multiple high quality photos, and make that an essential aspect of our unique 3-step verification process. We want everyone to feel entirely safe and comfortable that each user is the real deal, and up to date photos, in tandem with proper identification and contact information, helps us to accomplish this. 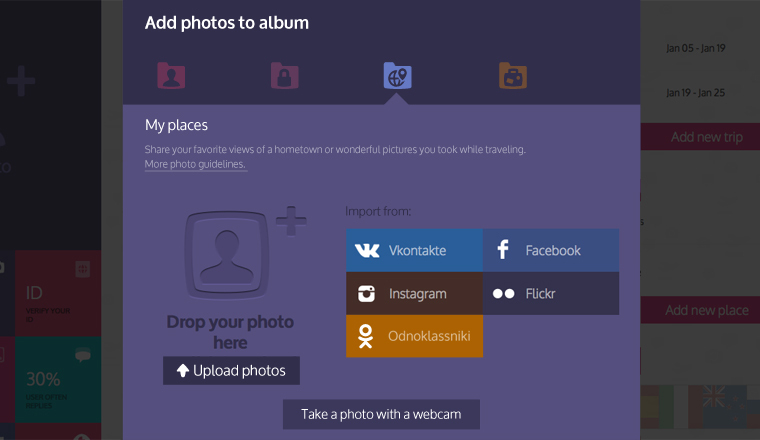 Soon, you'll be able to enjoy a superior photo browsing and interaction process. For instance, with the new photo preview layer, you'll instantly get shown a larger photo size as you're scrolling and looking at a person's profile. Plus, you'll be able to see who left likes on which photos. In the very near future, expect another update, which will offer full commenting functionality on photos, too. Previously, TourBar only allowed users to upload photos of themselves. This is still a key requirement for verification, as described above, and is encouraged to produce a higher quality profile. However, we are planning to offer additional photo albums, allowing you to display travel photos of your previous experiences, or even to showcase your local area or hometown, where you are available as a guide. We believe this helps to further encourage conversation and connection, as you learn more about each individual. That's not all, either, because one of the most exciting changes is the new Plane-Button. With the Plane-Button, you can instantly invite a prospective travel partner with you on a journey you're planning, offer to be their guide directly, or ask them to serve as yours. Elsewhere, if you have a Sony SmartWatch, you can now get notifications from TourBar sent directly to your watch via the Informer for SmartWatch app. No matter where you are, you'll always get an instant notification of what's happening on TourBar. If you're not already a member, then sign up today at TourBar.com to check out all of these great features and find a travel partner or a connection for vacation dating.